Last edited by Doug G on Fri Jul 13, 2012 21:01, edited 1 time in total. Ooh yuck, what has been in your fuel tank? Sorry , I sold my spare to Dave Biss. Unless someone has a spare, I think you're going to be really up against it to get another one. 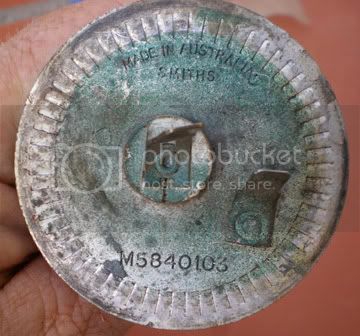 There is a chance that an Australian Mini one can be cannibalised and made to work, or maybe even the innards of a UK Moke one, but I think the UK ones bolt in rather than using that bayonet ring arrangement. They can be repaired, there is almost nothing inside them, just a coil of wire of known resistance with a moving contact that sweeps over it. A decent instrument repairer would be able to clean it up and wind on a new wire. Your two hopes of finding one in Australia are John Smidt, "The Mini King", miniman@healey.com.au or ask on the Australian Moke forum. 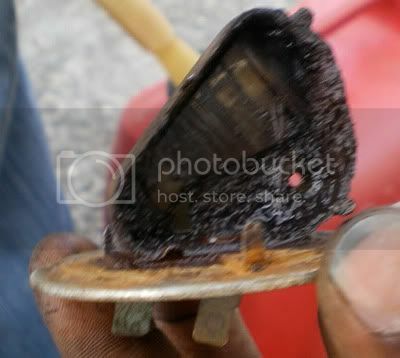 Tim wrote: Ooh yuck, what has been in your fuel tank? It appear years of #400040]accumulated gunge[/color], and #BF0000]rust[/color] along with #404000]old fuel[/color] that had evaporated significantly. All due to previous owner(s). The tank was then hosed out with water. We have good water pressure here. We got about a measuring cup full of the gunge out of the tank. The tank was then drained and a car exhaust blowing through it for about 10 minutes. After that clean gasoline was poured in swilled around and emptied. The clean gasoline and swilling process was repeated twice. The tank was then reinstalled. Later British Minis do use a bayonet fitting but the way the float arm fits to the sender is different if I remember correctly. I had a problem with the sender on my 79 Moke and contemplated using a Mini unit I had but in the end, I opened the Moke sender and repaired the wire break. Yes the mini sedan ones are sort of 90Â° to the Moke ones, however I think the Mini van ones are almost the same shape as the Moke ones, but they have the bolt holes around their perimeter rather than the bayonet fitting. I'd be confident that the innards have the same electrical properties but I don't know whether they'd be very easy to swap across. It would be nice to have another instrument on the Mini Moke that works. . .
Dean wrote: Later British Minis do use a bayonet fitting but the way the float arm fits to the sender is different if I remember correctly. I had a problem with the sender on my 79 Moke and contemplated using a Mini unit I had but in the end, I opened the Moke sender and repaired the wire break. Thing is Dean, that the sender unit is submerged as it connects on to the end panel of the fuel tank. To use a top mounted sender unit would require cutting another hole ( ) in the top of the fuel tank. Mind yo it too would get submerged in fuel. Is that OK? Doug G wrote: Mind yo it too would get submerged in fuel. Is that OK? Yeah, that's how they're designed. All those little sparks in there too..
Who knows. Modify a Mini van one, at least it will be electrically compatible. The holes around the outside edge will be the problem. Actually I reckon this one might be an even better starting point, assuming it has the same resistance as an early one you probably only need to bend the wire. I'm not sure why it has three terminals though, it would only need two. I assume it can be wired to measure either increasing or decreasing resistance for multiple uses. To be electrically compatible it would need to have a range of 20 -260 ohms (approximately). I am a bit wary of eBay. Never have bought anything off of it. I had a load of issues setting up a Paypal account.